Sneak Peak! 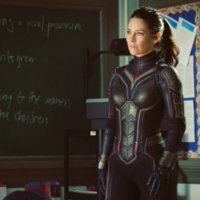 Evangeline Lilly Shares First Look Photo From The Ant-Man and The Wasp Set! The Wasp Goodness! Evangeline Lilly has shared the first look photo from the set of Ant-Man 2. She is dressed like The Wasp and looks awesome. It’s also the day that would have been Jack Kirby’s 100th birthday. Everyone together now.. Awwwww! Check out her tweet and the photo below!